What is the Bridge Project? The Bridge Project is a community based and supported Youth Diversion Project which provides a range of educational and recreational activities for young people between the ages of 12 – 17 in the Leixlip Garda District (Leixlip, Celbridge, Maynooth and Kilcock). A steering committee made up of representatives from the community, An Garda Síochána and Kildare Youth Services advise the project. The project is managed and operated by Kildare Youth Services. and funded by the Department of Justice and Equality. 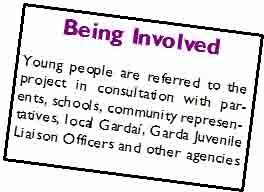 Garda Youth Diversion Projects are part supported by the Irish Government and the European Social Fund as part of the ESF Programme for Employability, Inclusion and Learning (PEIL) 2014-2020. What does The Bridge Project aim to do? ¨ at risk of being involved in crime or anti-social behavior in their local communities. Newtown House, Leixlip Youth and Community Centre, Leixlip, Co. Kildare.